No schedule for constructing Interstate 570 was ever planned, and the project was unfunded. The proposal never gained traction, with only the chamber of commerce openly advocating it. The Missouri Department of Transportation (MoDOT) did not propose this route, nor has AASHTO approved it. As of 2006, no known studies were made to upgrade this corridor to Interstate standards. Notably, Jefferson City is one of the few state capitals not connected to the Interstate Highway System. In 1970, an Interstate corridor along U.S. 63 between Rolla and Columbia via Jefferson City was submitted for approval by the state of Missouri, but it was rejected by the Bureau of Public Roads (BPR, now Federal Highway Administration).2 Today, U.S. 63 is largely expressway/freeway north of Jefferson City and is two to four lanes south of Jefferson City. Westbound Interstate 70 approaches Exit 148 for U.S. 54 southwest to Jefferson City. 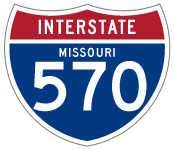 As proposed, Interstate 570 would travel along with U.S. 54 through Fulton to Jefferson City. Photo taken 10/16/04. U.S. 54 angles southwest from I-70 to Jefferson City, the state capital of Missouri. The route is a mix of expressway and freeway between Kingdom City and Jefferson City, with a freeway bypass of Fulton. Photo taken 10/16/04. Westbound Interstate 70 reaches Exit 148 for U.S. 54 southwest to Fulton and Jefferson City. Presumably this interchange would be upgraded to Interstate standards and provide a freeway-to-freeway connection if I-570 were built. Photo taken 10/16/04. Westbound Interstate 70 meets U.S. 63 in Columbia at Exit 128A. The Interstate 570 project would require construction of a systems interchange linking with U.S. 63 and I-70. Photo taken 10/16/04. “Chamber delegation has successful trip to Washington, D.C. – This may have been the most successful visit to the nation’s capital yet for a delegation from the Jefferson City Area Chamber of Commerce” Jefferson City News-Tribune (MO), September 26, 2006. Interstate System Add Requests: March 1970 compiled by Kurumi.com based on “Report on the Status of the Federal-Aid Highway Program”, Hearing before the Subcommittee on Roads of the Committee on Public Works, U. S. Senate; dated April 15, 1970; pages 89-91.